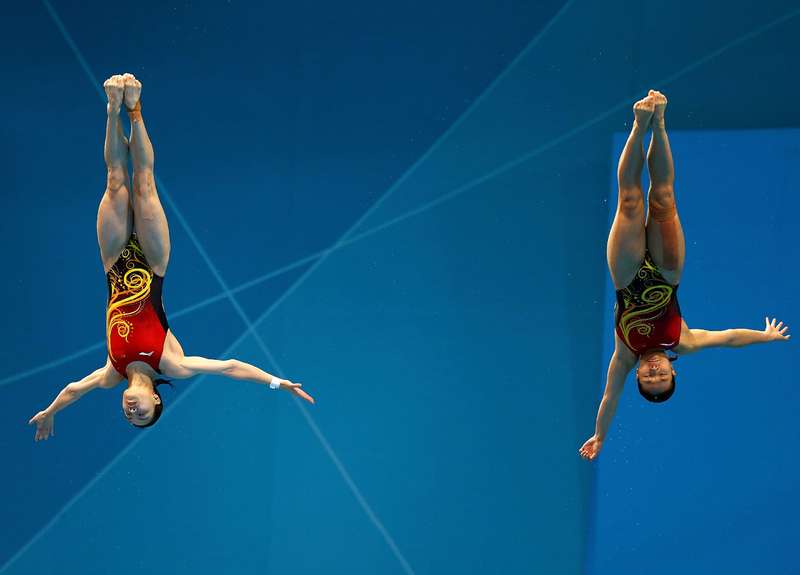 (AP) LONDON - Wu Minxia is close to crowning herself China's new diving queen. Wu and partner He Zi won the first diving gold medal of the London Olympics on Sunday, putting the country on a path toward a possible sweep of the eight medals. "It's kind of if they mess up, then you have an opportunity," American silver medalist Abby Johnston said. "Anything can happen in this sport, so you still have that possibility." It was Wu's fifth Olympic medal, one short of countrywoman Guo Jingjing's record of six medals. Guo was China's superstar diver until her retirement 1½ years ago. Wu has three golds, one silver and one bronze. She could earn another in the individual springboard event, where she has medaled twice before and will compete against He. "It feels normal," Wu said in Mandarin. "I really don't have that many emotions." "I am impressed by them," Johnston said. "I watch their video. That's one of my training methods, just watching them and how they do it." Johnston and Kelci Bryant finished second with 321.90 points, ending the country's diving medal drought that extended to the 2000 Sydney Games. It was the first Olympic synchro medal for the Americans. "Our curse is out of the way," said Bryant, who finished fourth in springboard synchro with a different partner in Beijing. "Abby and I just kicked it off with this event and I think the rest of the team is going to come through," she said. "After 2008, all of us were really close and we needed to fine-tune our training." Laura Wilkinson's gold on 10-meter platform in Sydney, where she upset the Chinese despite a broken foot, was the last U.S. medal. The Americans were shut out for the first time ever four years later in Athens and again in Beijing. "This is a new beginning," U.S. high performance director Steve Foley said. "We've got to forget the great USA diving history because really that was 20-plus years ago. It wasn't just 12 years ago when Laura won because they only got one medal, so the glory days were gone a long time ago." After receiving their medals  Bryant cried and Johnston smiled broadly on the podium  Bryant reminded Johnston to hold up her prize as they posed for a gaggle of photographers on the deck. "Ahhhh!!! So happy for our girls!!" tweeted American David Boudia, who will compete in 10-meter individual and synchro. "Great start." The U.S. duo was third after the first round, then moved up to second and stayed there despite a mere 1.5-point lead over Canada after the fourth round. Bryant deliberately didn't watch the scoreboard during the competition. "I have all the faith in the world when I get up on that board Kelci is going to hit her dive and I'm pretty sure she thinks I'm going to hit mine," Johnston said. Heymans claimed her fourth career Olympic medal, making her the first female diver to earn a medal at four consecutive games. She took silver on individual 10-meter in Beijing, bronze in synchro platform in 2004 and silver in the same event in Sydney, the first year synchro diving was added to the Olympic program. "It's really great and I hope it's going to inspire the other athletes to do well," Heymans said. Foley had emphasized achieving success in synchro since coming on board after Beijing. "It's scary they were listening to me," the Australian cracked. Foley looks for consistency and divers who can match each other's quality of deives. Each of the three synchro teams  the U.S. didn't qualify a team in women's 10-meter synchro  has one veteran Olympian and one rookie. Four years ago, 10 of the team's 12 divers had never been to the Olympics. "If you have the performance of your life you're going to be happy," Johnston said. "We had the performance of our lives and I'm ecstatic." Unlike the individual events, synchro diving goes directly to the final at the Olympics, with no preliminaries or semifinals.